But the autocomplete doesn't work. Does anyone have an idea of where the problem could be? When you install additional AJAX library support the Code Assist for that library isn't turned on by default. I installed the Aptana plugin to Eclipse PDT and the jQuery Code Assist worked fine once I realized that I was still using the PDT PHP Perspective instead of the Aptana Perspective. When I switched to the Aptana Perspective it started working. Sirokov pointed out that he was unable to get the Code Assist to work with PDT and Aptana Plugin unless he installed the Aptana Plugin first and then installed PDT second. I actually Had a hard time finding out how to install Aptana Plugins , so I am adding this in hopes that if someone else is confused they find it helpful. whether in Aptana itself or eclipse its the same. Also read this to get the code complete working. Basically, you need to update the File Associations to make *.js files use the Aptana editor. I had this same question as well. 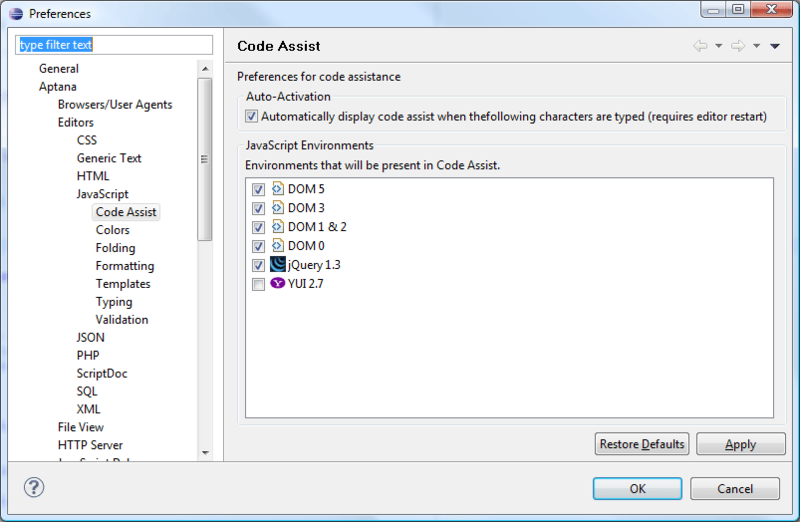 What I use is the JSDT jQuery plugin for Eclipse Indigo (has to be this version though) It has basic functionality, but I like it. There is an installation guide in the wiki. I also use Notepad++ for the autocomplete outside of Eclipse and to run jQuery snippets in a stand alone mode. The plugin for Notepad++ is located here. Not the answer you're looking for? Browse other questions tagged jquery eclipse eclipse-plugin aptana or ask your own question. How can I get Aptana's code assist to work with Google Maps API v3? How to enable jQuery Intellisense in Aptana? Code Assist of jQuery in Aptana?